Somersaults Dutch Cocoa- Ooo! My first repeat item in nearly a year of subscribing! And I don't mind at all. These are little round nuggets made of sunflower seeds and other grains. If you've never tried these before you need to. I recommend Salty Pepper, I think that's the best flavor. These are the Dutch Cocoa and they're not quite sweet enough for me. They've got a dusting of straight cocoa powder on them. They're good but not as good as the Salty Pepper ones. I was very skeptical of these at first because they seemed "too healthy" for me but nope. They're amazing and crunchilicious. Bobalu in Shell Almonds- I've never eaten almonds this way before. I mean, I've had them in the shell raw before, using a nutcracker to get them out but these are roasted. Roasted in the shell like a pistachio. They are very good. While it isn't exactly easy to get them out of their shells, it's not hard and they do have a great flavor. Alter Eco Velvet Truffle- This is milk chocolate with a milk chocolate inside. I don't really like milk chocolate so DH got to eat it. I prefer to use my calories for dark chocolate instead. 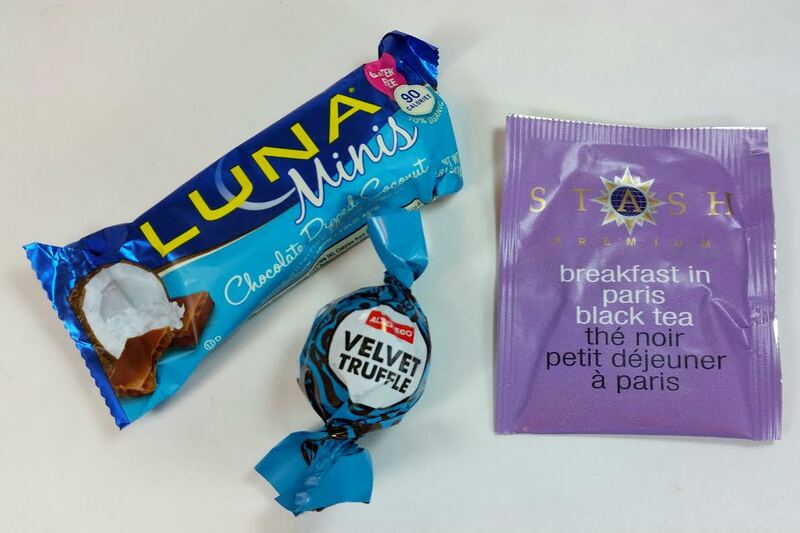 Stash Tea Breakfast in Paris Black Tea- One Stash Tea teabag. Hm. 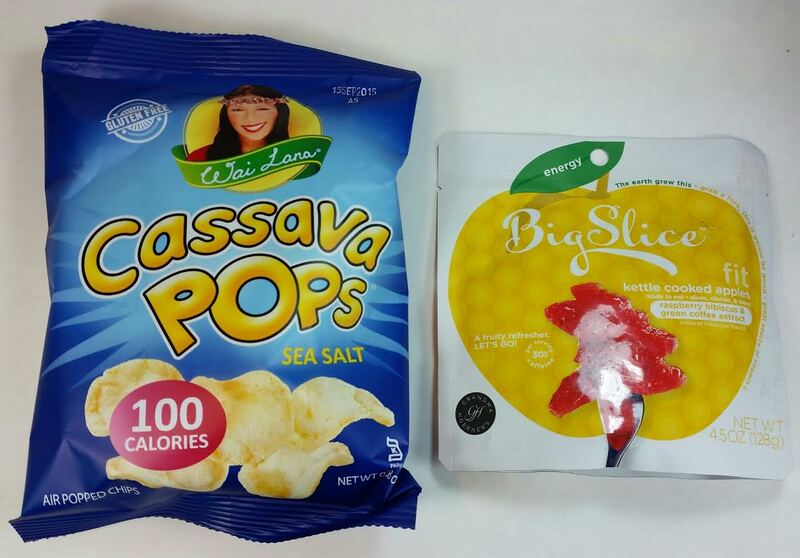 Wai Lana Cassava Pops in Sea Salt- Popped puffs that are crunchy like chips. These have an interesting texture. They're very crunchy which I like and the flavor is fine. They didn't blow me away but it was definitely fun to try them. Big Slice Kettle Cooked Apples- I have to admit that sliced apples gooshing around in a packet REALLY freaked me out. This was the last thing I tried just because all that gooshiness that I could feel when squeezing the packet totally triggered my gag reflex. These are kettle cooked apples with raspberry, hibiscus and green coffee extract. Opening it and looking inside didn't make me any happier. It smells like grape juice (which after I read the ingredients made sense because its second on the list). They actually weren't bad. Pretty soggy but not horribly so, they did provide some resistance against my teeth which was good (I am a total texture eater and I cannot eat things like pudding or yogurt). There were also crunchy bits which must be raspberry seeds. You can definitely taste the hibiscus and the flavor is strange. Not awful but strange. I don't think I like it... I wouldn't ever buy it, that's for sure. Part of the fun of Love With Food is not only discovering what you like but also what you don't like. Oh, I should mention that the box also came with a plethora of coupons. I never use them so I always forget about them in the review. This was my last box in a six month subscription. I renewed my subscription (I'm serious! I really like this subscription!) and will now be trying the Deluxe box for three months! I haven't had a Deluxe box before and it has 16-20 snacks in it. 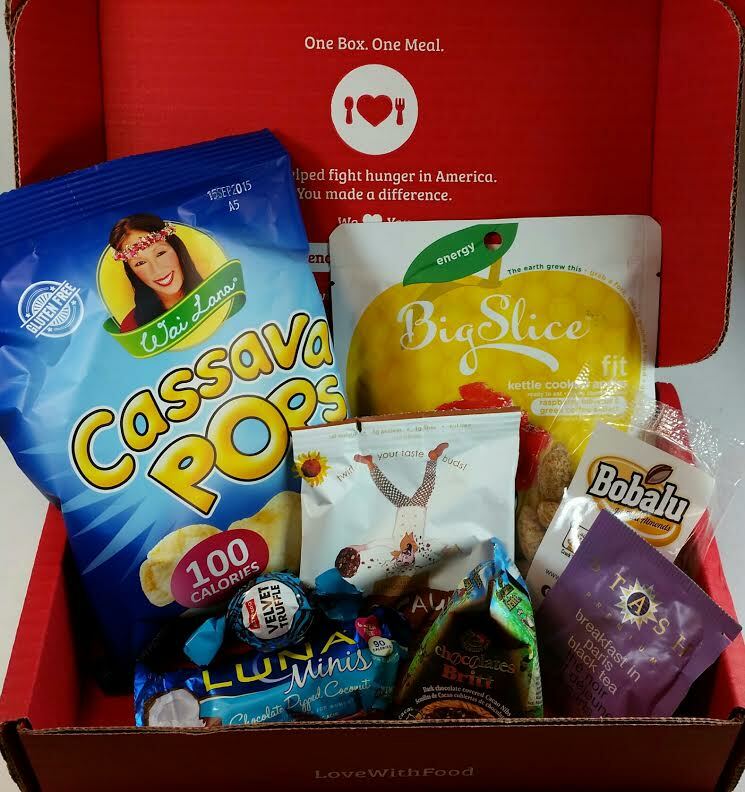 Deluxe boxes get more kinds of snacks, too. Things that a regular box doesn't get so I'm actually pretty excited to see the difference. If you would like to sign up for Love With Food, you can do that right here! Use my referral link to get your first box for $2 shipping. You can also use the code YUMMY to get the same deal. It's a great way to try this subscription and see if you'll like it. That's how I got hooked, though, I'm warning you! It's also super easy to cancel or upgrade your subscription through your account. If you'd rather sign up for a longer subscription, use code VDAY2015 to get $5 off whichever one you choose. The apples were not my thing, either. My fiance LOVED them, but they just didn't do it for me. I did get the salt and pepper somersaults and they were delish, but they can get really spicy if you eat a lot of them at once! whooboy! 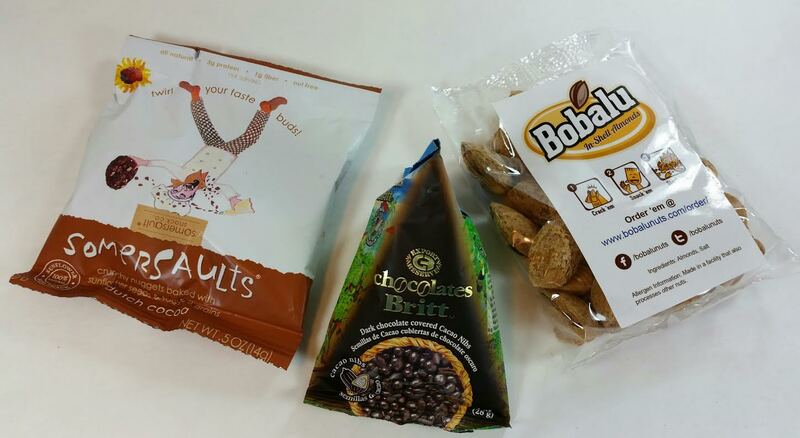 I really loved the Cacao nibs and the Cassava pops. I'm always looking for potato chip alternatives because I'm addicted to salty, crunchy things! LOL These were awesome for me! I agree the tea bag was just...no. Give us an artisan tea, or like 4-5 bags of Stash. If I can get it at my local grocery store for super cheap, I expect more than a single tea bag! I can only get the Salty Pepper ones online. Not very many stores have them around here. They're so flavorful! I also love salty, crunchy things! And I agree about the tea. Even two would have made me feel better but Stash?! Of all the teas, they definitely could have put more than one Stash teabag in there! Hahahaha, I always love reading your reviews after I've eaten my way through the box. :p I really loved the apples, even though it was definitely a little gross when I could squish them through the package. XD But I love the taste! I already ordered 5 packs because they're currently on sale for just $7.50. I wish I didn't like milk chocolate, it would save me a lot of calories from snacking! I really liked the apples, too, but I read a few other reviews where people weren't crazy about the texture and I totally get it. Oh and I inhaled the Britt Chocolates too! I must have been hungry when I read your review because I finally snapped and subscribed. ahahaha This box, even if this wasn't the best month, always looks so tempting. And the company ethos is really cool. I scaled back my Graze box to twice monthly and I'm giving this a try. WOO! Bring on the food/love. I can't stop subscribing, it's way too much fun :D Much more exciting than Graze, imo. I have to admit that when I got my first box, I didn't expect to still be getting it a year later.